Part of being a good documentary wedding photographer is about not just looking for the obvious image in any situation, but looking beyond it and trying to find an alternative view that still says something about the moment you’re capturing. This week’s Friday Finds is an image from claire + jonny’s wedding at the ss Great Britain in Bristol. Cutting the cake is one of those parts of the wedding day that everyone expects and it always presents some nice opportunities for images too – particularly if you look beyond the ordinary. The dining room onboard the ss Great Britain has beautiful mirrors along the length of each wall and mirrors and reflections are something I’ll always keep my eye out for, no matter where I am. 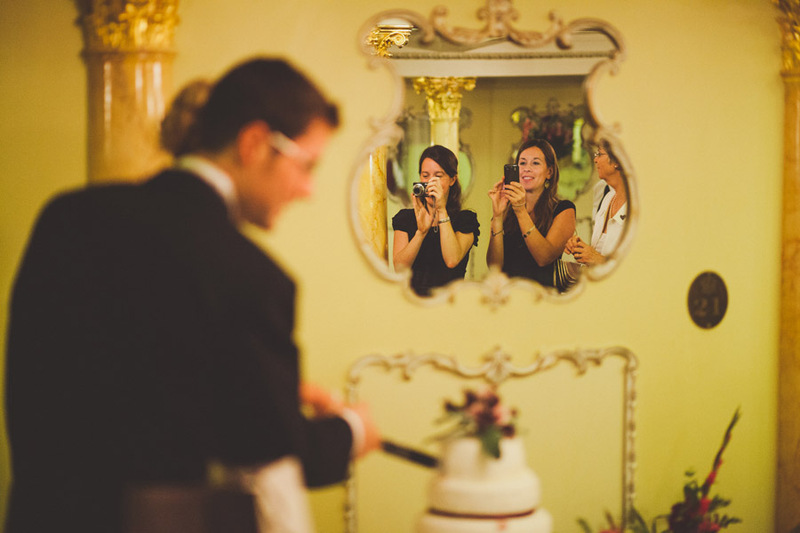 I like this image as it shows the couple in the midst of cutting the cake but from an unusual position and you can see the guests crowding in to take their pictures too.